I've attended three different colleges, gotten a Master's degree, and now I'm back on school for a professional certificate. In all of my previous University experience, I've been taught by academics. People who have dedicated their loves to the study of their particular focus: Shakespeare, computers, etc. What the Community College offers is a more motley collection of people. However, I have to say, they're a lot more colorful. I've been taught anatomy by a former chief of surgery, and now I'm being taught microcomputer apps by a Roller Derby coach who posts her own videos. It's quite the different perspective. I'm pleased to announce another sale, this one to Henrik Harkesn's Urban Cthulhu: Nightmare Cities. Editor Harksen's his first anthology, Eldritch Horrors, Dark Tales was a solid read, and I wrote “The Neighbors Upstairs” specifically for the follow-up. I'm quite tickled that he liked it. • “the guilt of each… at the end…” by Joseph S. Pulver, Sr. I still do. The school semester's over, and I've got to test out of something to get a class I've already taken (don't ask). I'm working more, and I have less time to write than I want because it's Spring, and in the Spring I get all ambitious and want to actually go do things. Last night, for example, we went out to see a movie for the first time in months. We don't go out to the movies much. There's a lot of crap being produced. As a friend said, Hollywood has the reverse of the usual business model. You can see the good parts of a movie for free in the trailer, but you have to pay to see the crap. Part of a movie's charm is the ambiance in which you see it. 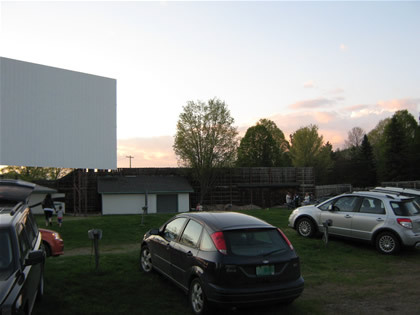 For this reason, and because we were hopeful but not expecting greatness, we went to the drive-in. 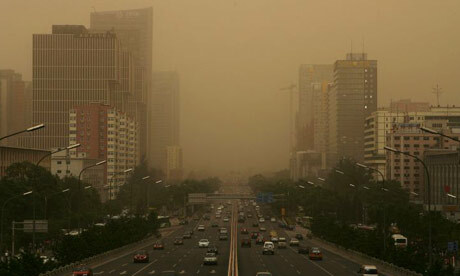 Mostly there for Thor, which could easily have been an enormous disaster, and Rango, which was only of vague interest. 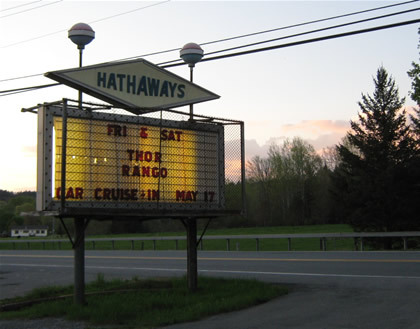 But hey, Hathaway's drive-in! I've blogged about it before, but this time, I brought the camera. It was a mild Spring day, the sunset was lovely, and the bugs were outside the car. You kind of bring your own environment when you see a movie from the comfort of your own car. Families were there, and kids were throwing a ball around before the show. It was just that sort of bucolic, rural scene that does happen every now and then, not just in peoples' nostalgic biographies. We used our radio for sound this time, and it sounded a lot better than using the provided speaker. We also visited the snack bar for tasty local burgers, pretty good fries (they provide vinegar for those of us who like them that way) and surprisingly tasty popcorn. An enjoyable way to watch a couple of films. It's not really the way to watch a film you really want to pay attention to, because there's people walking around, drivers entering and exiting, and overall a fair mount of distractions. But the average film doesn't require you to pay attention to every frame, so it's fine. I will want to pay attention to every frame of On Stranger Tides, so I'll be seeing it in a more traditional theater. But I'm hoping we'll catch another double-feature before it closes for the winter. Oh,the movie? Kim Newman was right, and Thor was well done especially considering the comic. The perfect drive-in film. Entertaining, pretty to look at (that the costume designer managed to turn Kirby's designs into wearable clothing is Oscar-worthy), with just the right amount of things blowing up. Rango was an amiable film, neither knocking my socks off nor wasting my time.